Kangaroo Island Spirits has launched a gin boasting 48 botanicals from its distillery garden – including home-grown juniper berries, which it says is an Australian first. Sarah and Jon Lark, who established Australia’s first dedicated gin distillery at Cygnet River in 2002, started planted their common juniper trees about five years ago and now have about 150 trees of four different varieties. The berries are among the four-dozen home-grown botanicals featured in their Koala 48, launched yesterday at the Tasting Australia festival. The majority of juniper used in the traditional distillation of gin in Australia is sourced from Europe; very little is grown in Australia because the climate isn’t suitable. But Jon says his varieties – juniper communis pendula (US), juniper communis hibernicus (Ireland) and two Australian cultivars – are thriving in Kangaroo Island’s cool coastal climate. 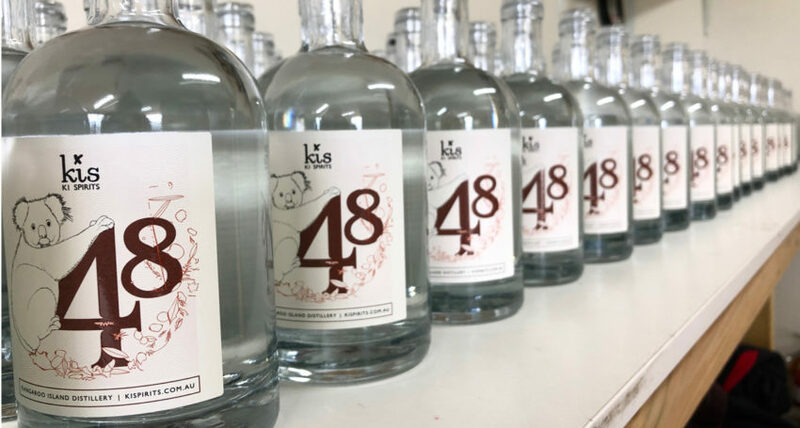 “To date it’s the first Australian estate-grown juniper to go into a gin and we put it into Koala 48 with 47 other botanicals from our block,” he says. “It’s created this very quirky and complex gin with lots of layers that start off with a nose of green coriander and finish with pineapple, bitter lemon and a whole range of cottage garden things going on. It is unlikely the Larks will ever be able to grow enough juniper to fuel their entire operation but they plan to use their pine-cone-like berries for limited releases such as Koala 48 and for special batches of their flagship O and Wild gins. “When you think about the juniper that everyone else in Australia uses a lot of, it comes from places like Macedonia where the trees are 400 years old and there’s mountains of them,” Jon says. “It’s a horrible prickly pine tree, it takes a long time to grow to get the volume that you need and if you’re competing with Macedonia then I wouldn’t have thought the price point would be commercially viable. Jon says juniper is being grown in other parts of Australia with varying degrees of success. “We put it in because everyone used to come here and say, ‘What is a juniper bush’, because most Australians would never come across one, and it’s done really well. The Koala 48 project was inspired by a chance encounter with one of the furry marsupials at the Cygnet River cellar door last year. It is also an Australian tribute the renowned German gin Monkey 47. Launched in 2011, Monkey 47 has an abv of 47 per cent and contains 47 botanicals found in Germany’s Black Forest. It has gained a global following and is sold in more than 50 countries, including Australia. “Kangaroo Island is known for its kangaroos but the island has also got a significant koala population and about six months ago an adolescent male koala walked through the back door of our distillery, which we’d never seen before,” Jon says. “We were standing around wondering how to tell this story in a bottle of gin and we had been thinking about Monkey 47 for a while. The koala that wandered into the KIS cellar door. Only 900 bottles of the limited-release gin have been produced, with an abv of 48 per cent. Like its German cousin it is in 500 ml bottles and is being sold for $95. Kangaroo Island Spirits is no stranger to success, winning a swag of national and international awards including Best in Show for its KIS O Gin at the Australian Gin Awards last month. KIS gins boast a distinctly Australian flavour enhanced by the inclusion of foliage from the coastal daisy bush (olearia axillaris), native boobialla and locally grown lemon myrtle and aniseed myrtle. The Larks found 48 distinctive botanicals in the distillery’s gin garden “without too much trouble”. “I would never suggest that we are trying to be better than them (Monkey 47); I think it’s a bloody good gin in its own right and it’s been very well received at a couple of tastings in the past couple of days,” Jon says. “It’s just a bit of Australian humour around the notion of a German putting 47 botanicals into a gin and we thought we’d have a go at using 48. “It’s a fun project but the likelihood of being able to match those 48 botanicals in exactly the same way is not going to happen so if there’s another batch it will be a version two. “One of the things that influenced us was guys like Gin Mare in Spain who are these third-generation distillers who decided to make a gin that represented their backyard and they broke all the rules by putting in things like olives and rosemary and basil. The Larks are exploring export opportunities into Asia and have recently visited Singapore, China and Japan to further negotiations. “When we were in Singapore and Japan there were a lot of people interested in the koala story and we’ve got one of Australia’s oldest and highest-awarded gin distilleries, but one of our greatest assets is that we come from a pristine place called Kangaroo Island.